In a large bowl, mix together flour, water, oil, and salt and knead until a smooth dough forms. Cover with kitchen towel and let rest for approx. 15 min. In a small bowl, season crème fraîche with nutmeg and pepper. Dice bacon and thinly slice onions. Finely chop chives and set aside. Preheat oven to 220°C/425°F. Roll out dough onto a sheet of parchment paper. Transfer to a baking sheet covered with parchment paper. 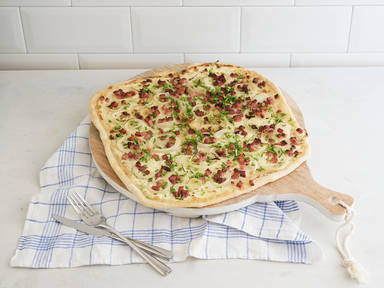 Spread crème fraîche over dough and top with onion rings and diced bacon. Bake at 220°C/425°F for approx. 15 – 20 min. Garnish with chopped chives and season with more pepper to taste. Enjoy!